Letters provided by Walter Pagels. Your letter of 20/9/45, airmailed at 7:15 p.m. on that date, came to hand last night, 6 weeks and one day on the way. At this fast rate of air traveling I am afraid lily tubers would perish on the way . . .
Now about that virgin garbed beautiful nymph you desire. Beware of her fascinating beauty. My old friend, Mr. C. T. White, is getting short minded from crowded work and roving about if he failed to tell you about the white nymph living here when he was at Kew some years back, for just before he went I sent him specimens of the floral belle. Mr. W. D. Francis, who is the acting boss in the absence of the chief, at that time could not be sure my white nymph was a N. gigantea. Our water nymphs are yet a bit mixed in names. I will see what can be done about luring the beauty out of her watery home or robbing her babies (seeds) to be airmailed to you, if the fare is within my purse. The white flowered form of N. gjgantea, as known here, is irregular in its appearance. I have not seen it the last two years. Will keep an eye for the white form but it grows in deep water, here 30 ft. or more, coming to the surface on a root stalk 40 ft. or more long; the tubers beyond my reach, and the seed will be hard to get, for water beetles devour the stamens and ovules. The flower will have to be protected, and I do not know how it can be done. Will try anyway. As to the white lilies with the blue ones in the pool near Rockland, Camooweal, I doubt their origin and how often seen. Will try to get in touch with the blacks there and get them to collect seeds if available; also will inquire from the roving blacks if white lilies are seen in other parts. Here only the blue N. gigantea occurs. In pursuance to my letter of 10/11/45, herewith enclosed please find seeds of Nymphaea gigantea white flowered form, or purporting to be this plant. Seeds were collected by the bush blacks, and seeds alone have no means to identify them. Our natives have long lost their natural honesty and adopted the white man's wiles. I hope that the seed will turn all right to your satisfaction. Meantime I am keeping an eye on the garden pools for the white beauty in the event of the blacks having tricked us. I am also sending seeds to Mr. C. T. White, who was expected back in Brisbane last Christmas, to have them tried in the Botanic Garden. Soon after I wrote you the previous letter I contacted the bush blacks and after filling their "tucker bags" [a bag used, especially by travelers in the Australian bush, for holding food] they readily agreed to get the seeds from shallow pools in the hills. They are expert at collecting these for to them they are equival of wheat to the white man. From these seeds they make good native bread, as they do with other species we despise. You will remember the Old History telling us the so-called Nile Lotus (which the trade foists on the public as the Egyptian Lotus of the tombs and monuments) was introduced in the Nile in the Roman period to stave off famine when the grain crops failed or all went to feed hungry Rome. I trust you received my previous letter okay. This one ought to have gone weeks back, but this place has been in blessful isolation since the 10th of last month by flood rains, and it is not known when the mail will next be through, though it has been fine the last few days. Camooweal P.O. is 180 miles from here; Burketown, the nearest, 140, but isolated by flooded coaster rivers at this period, our tropical wet season . 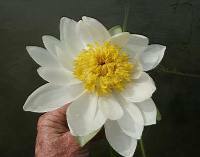 . .
"In October I made a special trip to Texas to see the white flowered Nymphaea grown by Mr. Proebstle. Arriving in Brazoria at 6 p.m., October 19, I lost no time in viewing the No. 2 plant. The flower was then fully expanded and Mr. Proebstle told me it stayed open day and night. I was sure that no waterlily did that, but he insisted that all of the fifteen flowers had closed the first night and remained open for the succeeding four nights. Being as I was from Missouri I had to be shown, so with the approach of darkness we again went out to the pools. Sure enough, the flower was still open. I was still not convinced and told Mr. Proebstle that it would be closed in about an hour according to all previous records of day blooming water lilies. At 10 o'clock, though, it was still wide open. It was hard to realize, even though some extraordinary things are done in Texas, and I had prophesied that it would be closed in the morning. My host woke me at 6 o'clock in the morning, saying, "Put on your bathrobe and come out and look at the water lily." The flower was still open, and it never closed from October 19 to October 23." These particular white Australians have since been lost in cultivation but recent expeditions may provide information as to their origin. See Field Collecting Australian Water Lilies - Expeditions 2000-2001 by Andre Leu, Field Collecting Australian Water Lilies - Expedition 2002 by Andre Leu, and Waterlily Hunting in Queensland by Nan Bailey.